Creating a Positive Micro-Climate Inside the Room. Penetrating and Protecting the Spaces You Can't Touch or See. 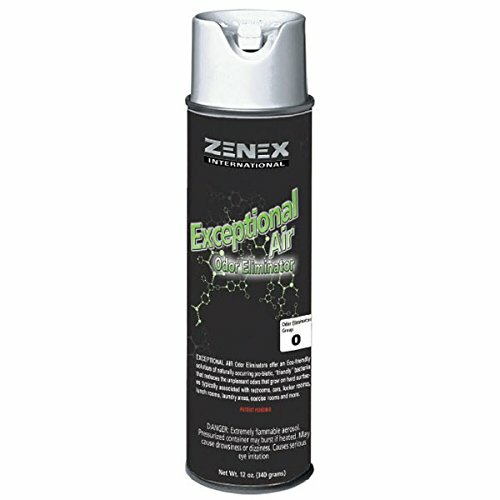 Exceptional Air Odor Eliminator is an Eco-friendly solution of naturally occuring pro-biotic, "friendly" bacteria that reduces unpleasant odors that grow on hard surfaces. Use in rest rooms, locker rooms, schools, restaurants, nursing homes, hospitals, hotels/motels, offices, smoking areas, garbage areas, basements or anywhere odors exists. Shake can vigorously for 30 seconds before use. Direct Spray pattern to ensure contact with hard surface. Products effectiveness begins with hard surface contact. GENERAL: Press firmly on spray button. Keep spray opening at least 12 inches from surfaces. TO COAT SURFACE: Aim spray towards ceiling in the direction of the problem surface and corners of room or other area to be treated. The atomized mist will quickly travel throughout the area coating the surface.. If you have any questions about this product by ZENEX International, contact us by completing and submitting the form below. If you are looking for a specif part number, please include it with your message.